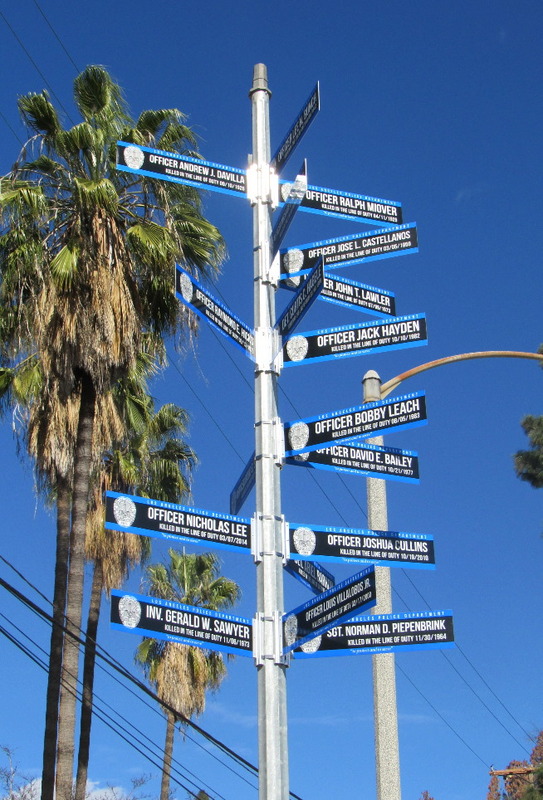 In May 2014, the city of Los Angeles unveiled a project to put up specially designed street signs to recognize and honor the more than 200 officers of the Los Angeles Police Department who have died in the line of duty. The signs are posted at or near the locations where each of the officers were killed, or at the Los Angeles Police Academy, at 1880 Academy Drive, near Dodger Stadium, in Elysian Park. The Police Academy sign currently includes the names of 18 officers, with the individual signs pointing toward the location where each officer died. The project was an effort of the LAPD, the Los Angeles Department of Transportation (LADOT) and District 12 Councilmember Mitch Englander, chairman of the City Council's Public Safety Committee. Each sign will have a designated number, the name of the officer, and the date they were killed, and the public will soon be able to go to a memorial website to learn more about the deceased officers, their service, and their sacrifice. On this website, we'll periodically add photos of the signs as we find them, along with the stories of the officers. As we recount the stories of the officers' lives and their tragic deaths, we will never mention the names or otherwise identify their killers. That information might be available elsewhere, but it will never be available here. These pages are intended to honor the fallen officers and their memory, not to publicize, glorify or even mention their killers.